I posted the company press release on Dr.'s REMEDY back in February and now I have them reviewed and am posting. 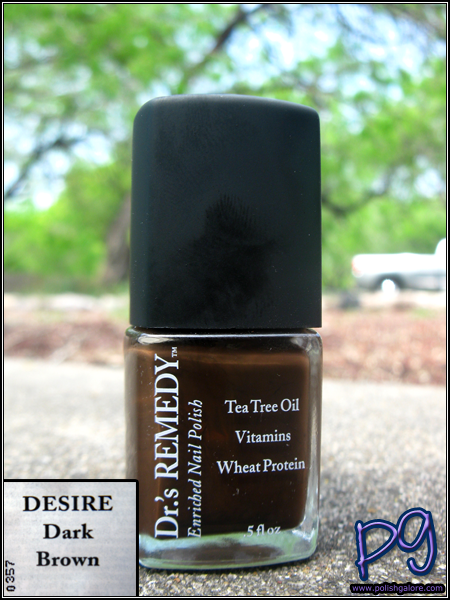 First up is Desire, a dark brown creme, or as they said "a cocoa-meets-hot fudge handsome hue." ^_^ I'm not the biggest fan of the square bottle tops because they don't line up perfectly after that first time. Boo. I used a base of Seche Natural, 2 coats of Desire and a top of Seche Vite. The formula was super nice and I seriously think this is one of my best manicures as far as polishing goes. I did have to clean up just a tiny bit with my paint brush, but not much. I can't quite put my finger on the color - I'm not sure if I love it or not. Part of me loves it because it's like a chocolate bar, part of me loathes it because it's dark brown. I've never been a very big fan of dark polishes. In the shade, it's quite a dark color - I don't mind dark colors on nubbins as much but on longer nails, I just get super self-conscious. It might be a great Konad base though! I really like these polishes! I found all three to have excellent formulas.